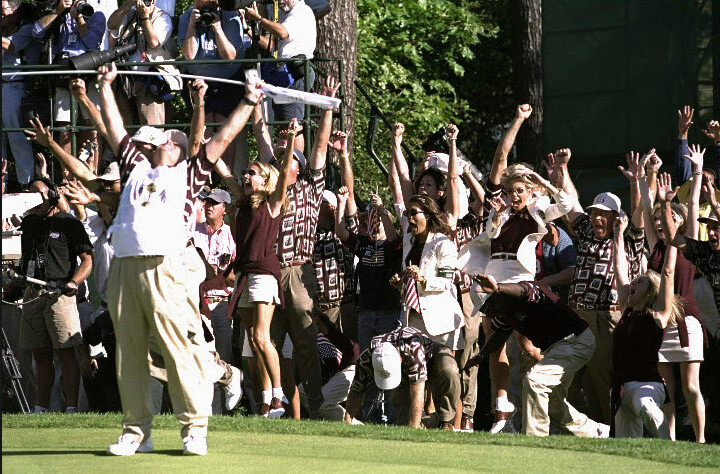 The date was Friday, September 24, 1999. 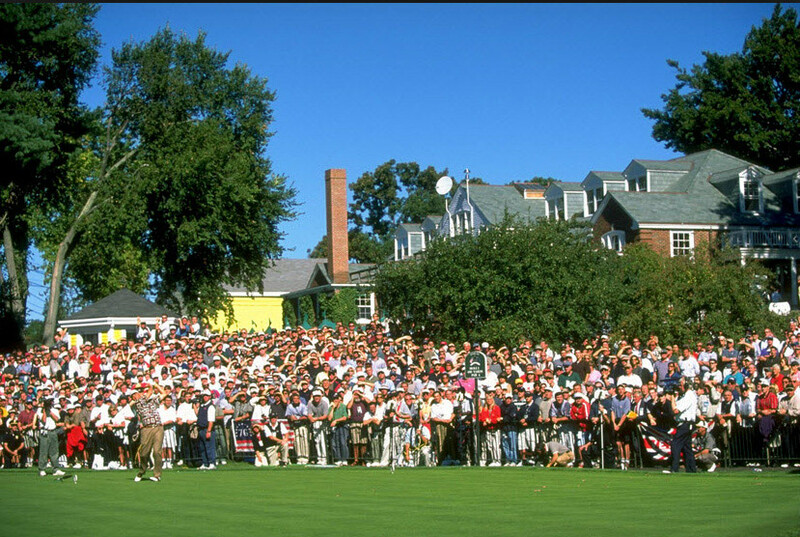 Several of my friends and I had traveled to the Country Club in Brookline, Maasachusetts for the opening round of the 33rd Ryder Cup Matches. The contest would forever be known as the memorable "Battle of Brookline". However, I remember it as the day that I met and laughed with President George H.W. Bush. It was late in the afternoon and somehow I lost my friends in the crowd. 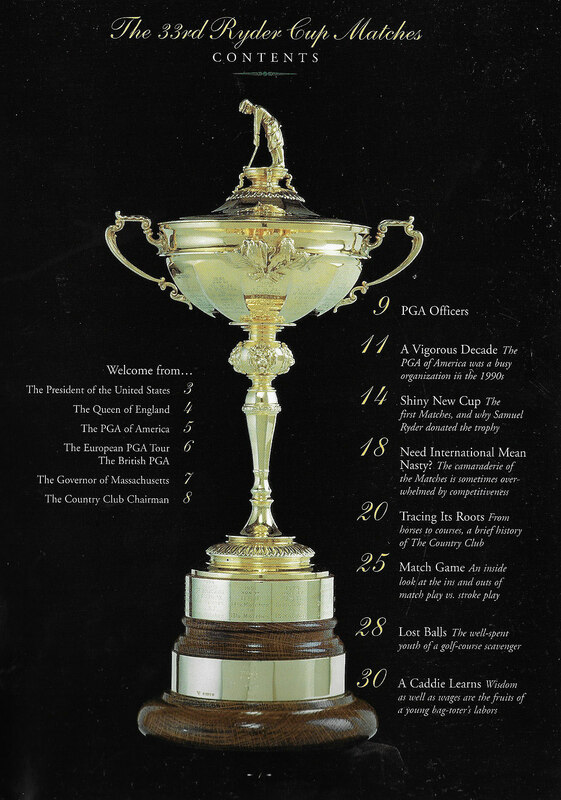 I recall being alone and thrilled to watch Justin Lenonard, Colin Montgomery, Jose Maria Olazabal, Tiger Woods and Payne Stewart challenge an amazing course before very excited American and European fans. I then heard a commotion behind me. It was a group of children who recognized spectator former President George G.W. Bush. They were forming a line to get his autograph. Realizing that I may never have another opportunity to speak with a President again, I joined the children with a copy of my Ryder Cup program. 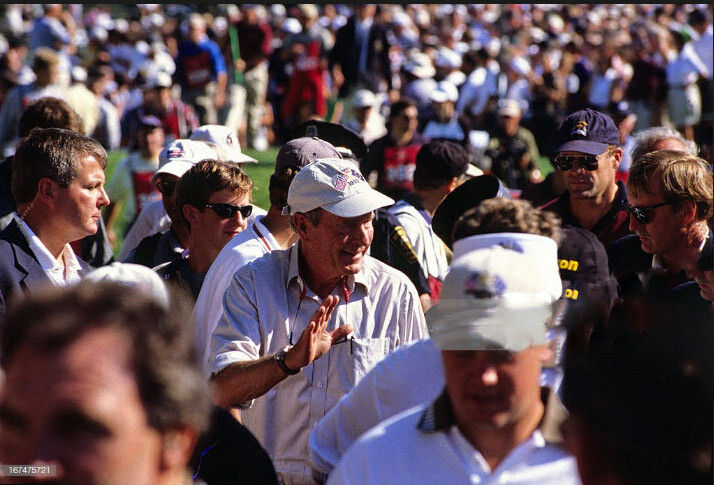 When it was my turn, I said to President Bush that it was an honor to meet him and asked if he could sign my program. He said yes as I randomly opened the program. President Bush looked down and said:"I am definitely not signing your program!" Surpised, I turned the program towards me and realized the problem. 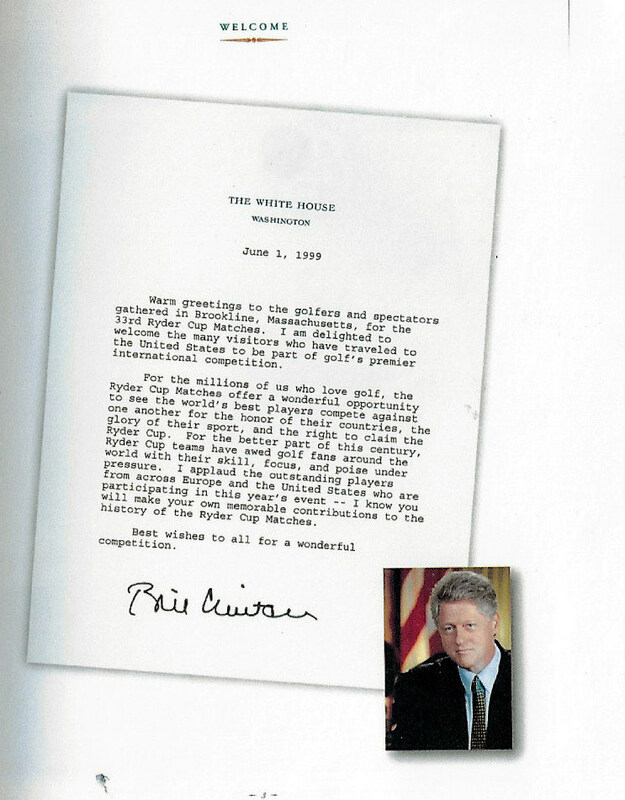 The page that I had asked President Bush to sign was this "welcome" from then President Bill Clinton! Both President Bush and I laughed as I turned the page of the program. 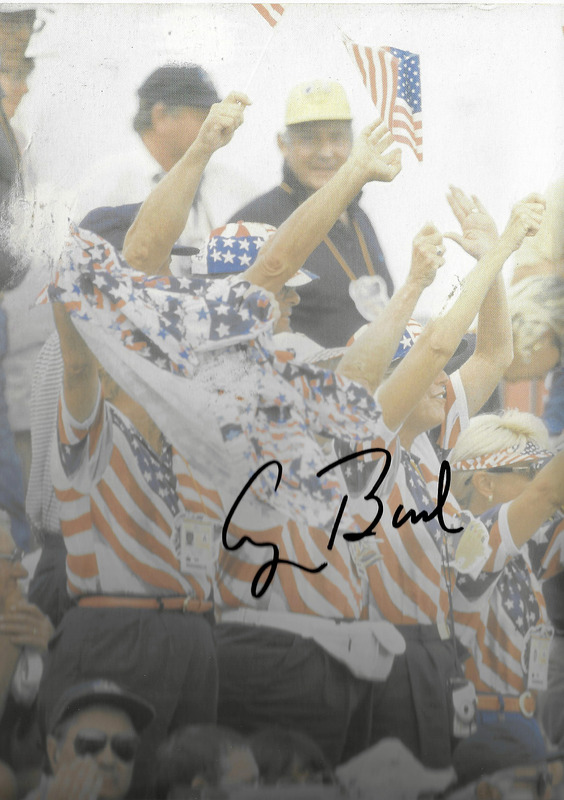 President Bush gave me this autograph. I still cherish this memory...especially today. Yes, this was in the time period of Mr. Clinton’s less than appropriate behavior. A few seconds of confusion and surprise followed by laughter. He’ll never forget this moment either, Howard. Thanks for sharing. God Bless President Bush, God bless America. Thank you for sharing this memory with us. Political party preference does not matter when you have a caring , honorable and trust worthy man or woman at the helm. Mr. Bush was indeed one of these people and set a fine example for not only the USA but for children to look up to as someone who did the right thing with no personal negative attributes or desires to tarnish his position or reputation. We are all better for his service to our country. Interesting encounter! Goes to show how important it is to read the document first before you sign it!. That certainly would have been a valuable conversation piece that Mel Erlick would have loved to have framed on his wall. Did you mention to him you are from the town William Casey lived in? With all the recent news about 41st president George Bush passing and his life’s history I was surprised that I never realized he was from the same city in Texas that also is where Jim Hall and his Chaperall collection reside. Thank you Walt for your comment about Mr. Bush, so true!